Thirteen Quill and Scroll members from every part of the United States have been named to the Q&S Student Advisory Board for 2019-2020. The 13 students will work on national pro-journalism projects for all Quill and Scroll chapters. Quill and Scroll’s first-ever Student Advisory Board met Friday, April 13 at the JEA/NSPA national convention in San Francisco. At that meeting, the 13 students who comprised the board will finalized Quill and Scroll’s national project for 2018-2019. Here’s your chance to get to know a few of them. I asked them what scholastic journalism means to each of them. Here are some of their answers. Scholastic journalism means community. It means home. 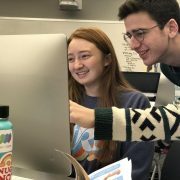 Creating a way to document the seemingly minute details of upper school and compiling them into a single outlet is the job that falls on journalism teams. We have the ability to show peoples stories, to bring light to things that have been ignored and to create a book that houses our memories. 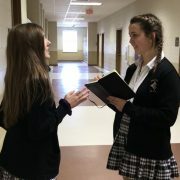 Scholastic journalism is, most importantly, a way to connect. A small group of people, who would have never talked before, people with differences that may have seemed unbridgeable, are brought together. Journalism is like the wind, invisible but always felt. Always moving throughout, in and out the lives of people, not always noticed, but when its gone, the ship it has been carrying will somehow lose its sense of direction. We are the people in the background, documenting and taking pictures. We are the people saving the most important moments and putting them on a site, on a page. We are creating the memories that in 20 years, students will want to pull out their books and take a few seconds to look back on their years, their time spent, their childhood, the place that made them who they are, and the people who chose to capture those moments in time. I am a junior and the managing editor on the Horizon yearbook staff. Recently our yearbook, “No, Seriously,” was honored by Kansas Scholastic Press Association as a 6A All-Kansas Yearbook. I think being a high school student becomes so focused on getting through the semester. We gage our time based on when our next test is, the six Fridays left until Spring Break or when a big paper is due. We rarely stop to think about those around us or what is going on in our communities. Scholastic journalism is so important because it provides a way to educate our peers about what is going on in our school, what is going on in our community and in our country. It is our responsibility to hold those around us accountable for being part of society, not just part of high school. My name is Bronlyn Holland and I am a junior at Ola High School located in McDonough, Georgia. This is my third year on my newspaper staff. I am the second year Sports Editor and upcoming Editor in Chief. I serve as the President-Elect (Vice President) for our Quill and Scroll chapter. 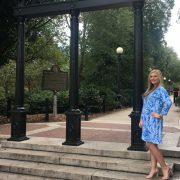 I am on the Georgia Scholastic Press Association’s Student Advisory Board and am the co-founder of the Quill and Scroll Student Advisory Board. Throughout these three years on staff, I have come out of my shell, learned what leadership entails and have networked with many advisors and professors while I have attended state, regional and national conferences. Usually, if someone is looking for me I am either on the sidelines of a football game or in a baseball dugout covering games. I have enjoyed this journey and can’t wait for what my last year stores. 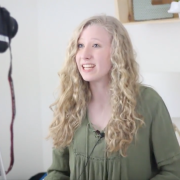 Scholastic journalism is important, because high school journalists are able to network with professionals, learn what their future career has in store and practice their First Amendment rights. Scholastic journalism was able to provide me with an opportunity to have a voice in my community and help inform my peers. At 14, I created my weekly opinion show called “The Hood Report,” where I feature three top stories from the past week in the categories of world news, sports, and pop culture. This show allowed me to bring a unique viewpoint to my audience by not only providing them with stories that one might find in a cable news network, but adding an entertainment factor by seeing my own perspective as a young, high school student. Scholastic journalism has been able to provide me with valuable leadership skills by becoming an editor on my school’s broadcast staff. I have learned how to effectively manage a team, hold my staffers accountable and build bonds that will help me in my future years to come. For me, scholastic journalism means the best part of my day. Every morning when I wake up for school, I am excited for one thing, and one thing only, my class for my student-run newspaper. Every semester, except one, my day has started in SJ, the south journalism building, and I haven’t looked back since. It means getting to express myself and explore a career that I want to go into professionally. It means experience in interviewing and writing and getting to tell someone’s story for a larger audience, something that I love to do. Scholastic journalism has opened new opportunities for me that I would never have otherwise known existed. It helped me find a family in my staff that has a special bond created from all the work we have gone through together. Much of the news we consume comes from an adult perspective, and while that is fine, it can cause members of the younger generation to feel alienated from the current events dialogue, falsely believing that their opinions do not matter. As a writer and editor for The Optimist, the newspaper of Bloomington High School South, I have tried to use my voice to draw attention to a variety of national, local, and school-wide issues. 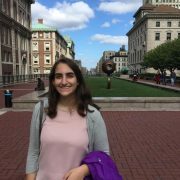 For example, when I learned that my high school offers almost twice the number of math and science AP courses as it does AP humanities courses, I wrote an article expressing my concern that this constitutes a disadvantage for students who wish to study the arts and humanities instead of STEM. I hoped the story would capture the attention of my fellow students and include them in a dialogue about school curricula. Additionally, with the rest of the newspaper staff, I developed a weekly news briefing to inform student readers about the week’s most important events—stories recommended by their peers as pertinent. That is why scholastic journalism is so important: it gives students a voice to expresses their distinct perspectives.